Quiltville's Quips & Snips!! : Fredericksburg, Texas! Willkommen! Yesterday Irene and I took a little road trip to the Texas Hill Country! I have heard many wonderful things about Fredericksburg, Texas – but I’d never been there. In all of the many trips I’d made to Texas – I was going somewhere new! Fredericksburg was founded in 1846 and named after Prince Frederick of Prussia. Old-time German residents often referred to Fredericksburg as Fritztown, a nickname that is still used in some businesses. The only sad thing for me? I was only here for a mere 6 hour workshop before moving on to Kerrville ---and it was SUNDAY, so even the little kitchen shop that Irene wanted to stop at to pick up her favroite cherry balsamic vinegar was closed. BUMMER! Such a cute place – I will just have to come back, won’t I?? Our drive through the hills! It was a rainy morning in San Antonio, which was wonderful – really. They have so much drought that any bit of moisture is very welcome and something to be celebrated. It took us about an hour and a half to make it from Irene’s to the workshop and we chatted and laughed and sang our way through these rolling hills ---I’d also love to come back and see them green with grass and covered with blue bonnets. Yes, I definitely need another trip! 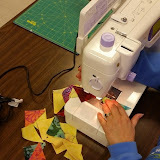 Things I love about visiting guilds and getting to know the quilters one on one? EVERYONE has a story! These two have been friends since college! You’ll have to excuse me because not everyone was wearing a name tag ---and I walked in, gave a 6 hour workshop to 24 students and packed up and moved on ---but the gal on the right lives in Colorado and flew down on Saturday to stay with her colllege friend who lives here so they could take the workshop together and spend the weekend catching up! I love this! Quilting may be great on its own – but if you stop to think about it, it strengthens our relationships as friends. It has indeed brought the most wonderful people into my life that I would not have met otherwise. The fabric and the thread are just the beginning – but the relationships are EVERYTHING! And then so are the goodies we discover! Check out this notions box! this folds up into a little black box with latches, much the same size as a featherweight case. Our quilter was quite balanced, featherweight case in one hand, notions case in the other – and she says she is never without it. COOL! I think she said this came from Target in the cosmetics aisle several years ago – I have no further information on it, but be on the look out! Things I love about not providing kits where 24 people make identical projects – the VARIETY! This one has so much fun going on in it. Vintage sewing machines? YES! Airplanes? YES! These are things that mean something to the maker of these blocks and she is making her quilt her own! You too can find the free pattern for My Blue Heaven under the Free Patterns tab at the top of the blog. It will show you how to use the Easy Angle Ruler and the Companion Angle Ruler for doing the half square triangles, hour glass units and Flying Geese units in this quilt –dig into your scraps and have some fun! Click the image below if you are unable to view the slide show on your mobile device. You’ll be taken to the photo album for viewing. This morning I am meeting with the Hill Country Quilters in Kerrville for their guild meeting and my presentation. A whole NEW group of quilters to play with! Have a terrific Monday, Everyone! I found a sewing box at an antique mall that is very similar to this notions box. It is all wood and unfolds like that. It was full of old sewing notions. I love it. I haven't cleaned it out and put my stuff in it yet, but seeing this one has inspired me to do so. I will get a picture of it and email it when I get home from work today. thanks for sharing your adventures. Yes, the blessing of rain, the mystery of fog, the silence of snow. These are the "neutrals" in our beautiful world. Yes, you need to go back to Fredericksburg, during the week. Visit that kitchen shop. It's jam packed with lots of fun stuff. We were there in August. You also need some local peaches. YUM! You were also a hop, skip and a jump away from Luckenbach (Willie Nelson's hometown). Not much more than a bump in the road, but, fun to say that you've been there. Bonnie, I "googled" Target cosmetic case -- and here it is! I have some of that sewing machine fabric. It's at least 20 years old. Made my sewing machine cover out of it. Have fun in Kerrville. Great shop. Definitely need to swing into Lukenbach & the feed store just outside of it. I know I will be making another My Blue Heaven one day...I truly love how that quilt comes out in every colorway! I agree with other comments....you must go to Luckenbach! Everyone is somebody in Luckenbach. And on your next trip to Kerrville, bring your husband and his bike -- he needs to ride the "Twisted Sisters" while you sew. Don't quilters find the most interesting things to re-purpose?! I love that case! How fun! Don't miss Creations while you're in Kerrville!! Bonnie, I think that case that folds out is called a Syskrin, or it sounds like that..I have one made of wood and it opens with lots of space. You will want to make that next trip to Fredericksburg in June or July when the peaches are ripening. Nothing like a fresh hill country peach! Thanks again for the great workshops in San Antonio! I took a detour on Friday through the Texas hill country. We were on our way to New Orleans to visit my daughter, son in law & grandson. My husband wanted to avoid driving through San Antonio traffic and programmed what we thought was a "short" detour on the map app on his phone. He then took a nap and I started driving. The detour wasn't so short but we avoided the San Antonio traffic, my hubby had a good nap and I enjoyed a beautiful scenic drive! The only downside was that I didn't take the time to stop anywhere, but a stay in the Texas hill country is now on my bucket list! An Afternoon in Tampa! Let the Fun Begin! Snow Day=Spider Web Sew Day! SNOW is a Beautiful Four Letter Word! From Frozen to Hot Water! Debbie, Charlotte & Bonnie QUILT VEGAS!! Lots of Scraps, Loads of Strips, and NO WATER! Just a Bit of Water Trouble! A Visit to One Quilt Place, Fredericksburg, TX! Time in the Love Shack, Kerrville Group 2! Galaxy-gram! Dinner in Fredericksburg, Texas! Sewing Up a Kerrville Love Shack! Group One! Galaxy-Gram! Love Shack in Kerrville, Day One! Some Texas Showing & Sharing! Galaxy-Gram! A day in Fredericksburg, TX! Scrap Crystals in the Afternoon! Some Valentine’s Day Quilt Love All Around! Pink Blooms for Valentine’s Day! Galaxy-Gram! Texas Tumbleweed Kind of Day! Vintage Quilts, New Braunfels Style! Galaxy-Gram! Sew, Sew, Sew &Go, Go, Go! Sew! I Have a PROBLEM! San Antonio and Sewing Time! In Pursuit of the Completed Spider Web Top! A Bit of Greensboro Show & Share! Easy Street to Greensboro, Day 2! Leaders, Enders & The APQ Quilt Along! Easy Street to Greensboro, Day 1! Galaxy-Gram! Scenes from Easy Street! A Bit of Quilting and a Greensboro Local Program! Flowers, Shout Outs, Quilts & Chairs! Squaring Up the Square in a Square! Headed Home, and some Challenges. Cleaning, Oiling and Test Runs! Lori, Mona & Bonnie at the Antique Mall!